The BC government recently announced that major new public infrastructure projects, such as the Pattullo Bridge, will be subject to a “Community Benefits Agreement.” The agreement requires that public benefits flow not only from the outcome of a project, but also from the process of building it. The move was immediately criticized by some industry groups and pundits, who have been wringing their hands about the fact that workers will become union members while employed on projects like the Pattullo (apparently on the assumption that this is a bad thing). Yet there has been surprisingly little discussion of the well-established benefits of this model. BC is experiencing a sustained shortfall of skilled tradespeople, and that shortage is expected to worsen in the coming years. In this environment, increasing apprenticeship opportunities is indeed a sensible and urgent priority. BC’s apprenticeship system has been seriously eroded over the past decade, leaving us in worse shape than other provinces. To help address this, the new CBA model will require that 25% of positions on major new infrastructure projects are filled by apprentices. When making large public investments in infrastructure projects, it makes sense to get the maximum possible benefits. The second objective, boosting the representation of women and Indigenous peoples in the trades, is also a welcome move. There is strong evidence that a Community Benefits Agreement can deliver. In fact, eighteen years ago, the CCPA published research on a similar public infrastructure agreement, which was used in building the Vancouver Island Highway in the 1990s (at the time it was called a “Project Agreement” rather than a “Community Benefits Agreement”). The CCPA study The Road to Equity evaluated whether the agreement was able to achieve its equity goals. The degree of success was impressive. 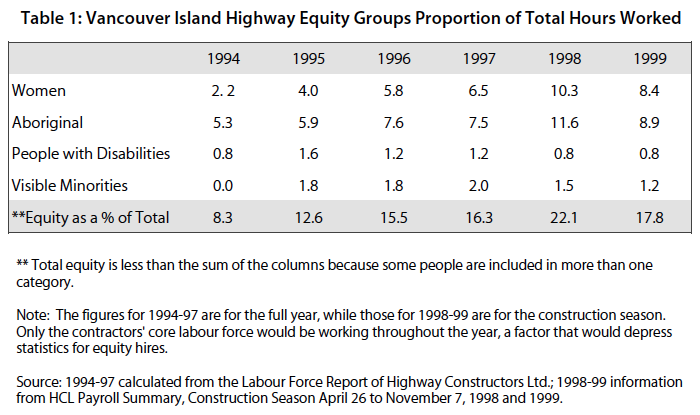 The proportion of equity groups on the job rose steadily over the course of the Vancouver Island Highway Project. In 1994, Indigenous peoples, women, people with disabilities and visible minorities worked 8% of the total hours on the project, and by 1998 this had risen to just over 22% of total hours. By contrast, the authors cite a 1990 survey of unionized construction workers that had found less than 1% of representation of indigenous peoples and women. “Efforts to ensure equity on the Vancouver Island Highway Project were stunningly successful and should be a template for other large-scale construction projects in BC,” concluded authors Marjorie Griffin Cohen and Kate Braid. When making large public investments in infrastructure projects, it makes sense to get the maximum possible benefits. Since we know industry isn’t taking on enough apprentices, it makes sense to require more apprentices. Similarly, since we know the industry tends to be male-dominated, it makes sense to ensure that the funds are directed to ensuring equity hiring and training opportunities. Perhaps it’s not surprising that, despite some loud criticisms, recent polling found overwhelming public support for using Community Benefits Agreements. CBAs have also been increasing in use across North America in recent years, including on major projects in Ontario. As we’ve seen, BC has direct experience with the model—and clear evidence that it can work.